Happy New Year. Well, it’s January, so we can still exchange wishes. 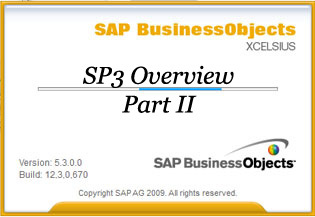 As you all know, towards the end of 2009, SAP released Service Pack 3 for Xcelsius 2008. I started a video series to show you what’s new in the latest service pack. This is a 2 part series. In part I, I showed you how to download and install the service pack. I also talked about the new components. As promised, here is part II. In these videos I talk about the new features and also performance enhancements. I tried to squeeze it into a single video, but I couldn’t and since I can only upload a 10min or less video on YouTube, I split it into two. So part II comprises of 2 videos. Don’t forget to watch both of them to get a complete overview. I tried to do my best to cover all the new features, if I had missed something, please feel free to use the comments section to shout it out. Watch the videos after the jump. Great Job Kalyan! You have a new fan! I look forward to learn more from you. The two videos you uploaded to Youtube are titled wrongly: “Xcelsius Gurus Overview of Xcelsius 2009″. You’re a bit ahead of us there – it’s still Xcelsius 2008. @Karsten, Thanks for pointing it out. We wish there was Xcelsius 2009 and we have a copy of it . Anyways, it is fixed now.